OM-USCAN Series dataloggers will store either one channel or two channels of temperature data from the built-in internal temperature sensor and/or optional external temperature sensor. The datalogger is set up through software with the logger connected to the OM-USCAN-RS232-INT serial interface which is in turn connected to your PC's communications port. Once the datalogger is set up it can be disconnected from the serial interface and put out in the field to log data. To download stored data, simply re-connect the datalogger to the serial interface, readout the logged data using the Windows software and store it on your PC's hard drive. In the setup mode, the software has a setup window that allows you to start the datalogger and program various setup parameters including (1) sensor selection, i.e., store data from internal, external, or internal and external sensor, (2) monitor data in real time scan mode (in this mode the logger is connected to the PC and an on-line temperature sensor is connected to the logger), (3) select measurement interval (sampling rate), and (4) delayed start time (if desired). Downloaded temperature data can be displayed in graph format for one or two channels or displayed in table format suitable for export to Excel. If two channels of data are graphed, the software normally plots two channels on separate traces but can also display the average of the two traces, the difference between the two traces, or superimpose the two traces on the same plot. Statistical values of stored data including minimum, maximum and average can also be displayed. 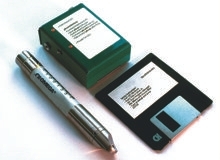 참고: Dataloggers are supplied with battery and complete operator's manual.